Steering knuckle arms that address bump steer on 1964-72 A-bodies using stock spindles and performance tubular arms. Global West supplies forged steering knuckle arms for 1964-72 A-bodies. A-bodies include Chevelle, Malibu, GTO, Lemans, Cutlass, Olds 442, Buick GS, Skylark, and others. The steering knuckle replaces the factory knuckle and corrects bump steer when performance suspension and alignment is being used with 4 to 6 degrees of positive caster. This much caster is only found in tubular control arms. Stock arms will not get to these setting even with offset shafts. The benefits of adding more caster will improve turn in and promote overall better handling but bump steer needs to be addressed to finalize the suspension upgrade. What is bump steer? A-bodies have always had bump steer from the factory. An example of bump steer is when the tire goes over a bump and as the suspension moves accordingly, the arc of the the suspension (control arms) is different from the arc of the steering linkage. Because of the dissimilar arcs the tire points a different direction from your intent causing the car to veer or wander. This appears to the driver as instability. It simply is a combination of all the suspension components reacting to conflicting arcs. When you bump steer a vehicle you attempt to correct the arc of the steering by matching the arc of the suspension. Bump steer kits are out there but they require an alignment machine and someone who knows how to bump steer a vehicle. Here at Global West we do a lot of bump steer repair. We have determined that by building a bolt on steering knuckle arm that puts the tie rod in the correct location as well as improving the steering ratio would finalize the suspension upgrade. This is of coarse based on the car with Global West control arms but will also work with other suspension arms that use stock A-body spindles and run 4 to 6 degrees of caster. 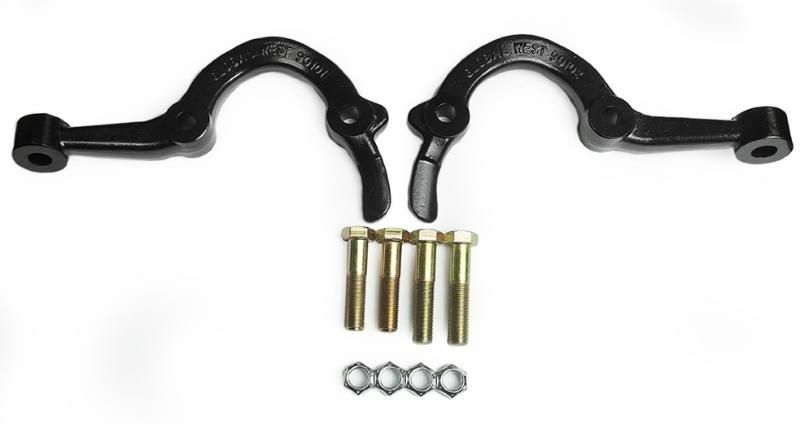 The steering knuckle arm kit comes with new hardware and plugs directly in to the stock spindle. The bolts are 1/2 inch and for those cars from 1964-66 that may have 7/16 bolts, the holes in the spindle will need to be opened up to 1/2 inch. Note: This steering knuckle arm measured from the 1/2 inch bolt hole to the tie rod hole are shorter then factory in order to speed up the steering response. Global West supplies forged steering knuckle arms for 1964-72 A-bodies. A-bodies include Chevelle, Malibu, GTO, Lemans, Cutlass, Olds 442, Buick GS, Skylark, and others. The steering knuckle replaces the factory knuckle and corrects bump steer when performance suspension and alignment is being used with 4 to 6 degrees of positive caster. This much caster is only found in tubular control arms. Stock arms will not get to these setting even with offset shafts. The benefits of adding more caster will improve turn in and promote overall better handling but bump steer needs to be addressed to finalize the suspension upgrade. What is bump steer? A-bodies have always had bump steer from the factory. An example of bump steer is when the tire goes over a bump and as the suspension moves accordingly, the arc of the the suspension (control arms) is different from the arc of the steering linkage. Because of the dissimilar arcs the tire points a different direction from your intent causing the car to veer or wander. This appears to the driver as instability. It simply is a combination of all the suspension components reacting to conflicting arcs. When you bump steer a vehicle you attempt to correct the arc of the steering by matching the arc of the suspension. Bump steer kits are out there but they require an alignment machine and someone who knows how to bump steer a vehicle. Here at Global West we do a lot of bump steer repair. We have determined that by building a bolt on steering knuckle arm that puts the tie rod in the correct location as well as improving the steering ratio would finalize the suspension upgrade. This is of coarse based on the car with Global West control arms but will also work with other suspension arms that use stock A-body spindles and run 4 to 6 degrees of caster. 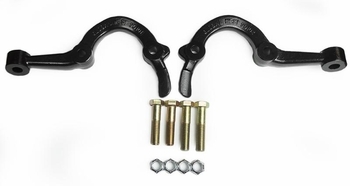 The steering knuckle arm kit comes with new hardware and plugs directly in to the stock spindle. The bolts are 1/2 inch and for those cars from 1964-66 that may have 7/16 bolts, the holes in the spindle will need to be opened up to 1/2 inch. Note: This steering knuckle arm measured from the 1/2 inch bolt hole to the tie rod hole are shorter then factory in order to speed up the steering response.